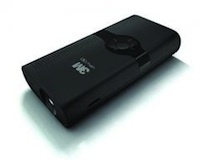 3M has introduced its new Mpro150, a pico projector that the company said combines the advantages of a pico projector coupled with several presentation tools not usually found in devices in the pico category. The MPro150 supports Microsoft Office applications (Word, Power Point and Excel), as well as Adobe PDF, photos, and video. It includes 1 GB internal memory, a micro SD card slot, and a USB input for transferring files from a laptop or netbook, allowing entire presentations to be pre-loaded onto the projector itself. Images can be projected up to 50 inches at 15 lumens brightness. For personal audio applications, the unit incorporates an MP3 player and headphone jack. Sound can also be shared using the integrated stereo speakers. Standard with the pico projector are an integrated flip stand, tripod, and a variety of input cables, making the MPro150 ready to use immediately with a wide range of video output devices. Available optional accessories include an adapter cable for Apple products, component video cable, and car charger. The MPro150 is slightly longer than 5 inches and weighs 5.6 ounces. It is available now for pre-order from 3M and Amazon. The estimated price is $395.